Water features can bring a whole new dimension to your backyard pool. From something like a simple laminar to a more extravagant feature like a natural waterfall, the concept of moving water attracts attention and gets people talking. By incorporating water features into your poolscape, you’ll not only add an artistic element, but more depth, as well. Rather than just having a beautiful pool, you now have a beautiful pool with constant movement and fluidity — a design trend that differentiates between the good and the great. Water features can be one of two things: artistic or functional. Artistic water features create a sense of depth and design to a pool while functional ones give swimmers a waterfall grotto to hang out in or a water slide to to fly down, for example. Whatever your preference, there are a variety of features to choose from — fountains, waterfalls, scuppers, laminars, spillways and sheers, to name a few. Because each type of feature creates a specific effect, it’s important to know what look it is you are trying to achieve with the water. Do you want to create an arc of water lit by an LED light? Do you want pencil-like streams of water streaming from your pool wall? Or do you want something that replicates a geyser in a natural spring? While water features are better integrated into a new build, they can also be retrofitted into your existing pool. Either way, their visual appeal will keep people talking. 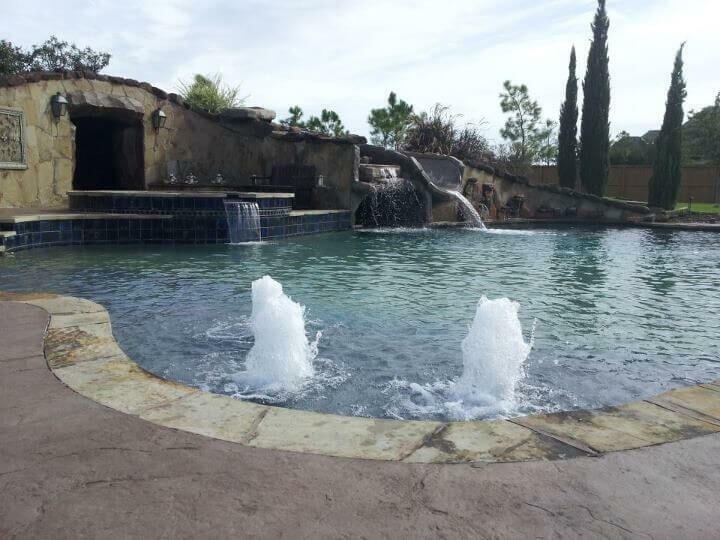 For more information on pool water features to incorporate into your poolscape, please visit our pools and spas page of our website.